Growing up in the small town of Valley City, ND, I felt like very little things had changed through the years. In 2009 while attending college at BCSU, the Sheyenne River continued to rise, reaching a record of over twenty-two feet. When the flood stage is eighteen or nineteen feet. For the first time in VCSU's history, the school had to shut down completely, cancelling all classes and students returned home. My home was Valley, City, and we had to live with a collapsed sew system. There many port-a-potties along the city blacks. Those who remained in town after being urged to evacuate, had to shower at friend's homes who lived in the country. I remember the nearly deserted roads mostly seeing large trucks carrying clay and dirt to dike building sites, and sandbag central up at the Winter Show building. At this time, I walked around down town to take photos of my city during this difficult time. 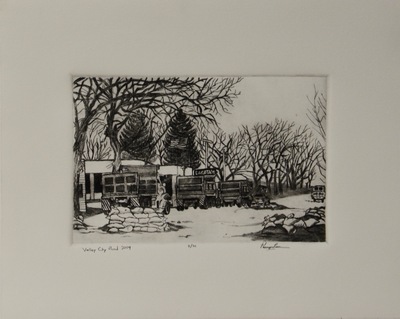 My print is of an image of three large trucks carrying dirt carefully moving down the street trying to get past all the sand bag structures lying in the middle of the road like an obstacle course. This scene takes place near a bank that flew an American flag high into the sky.